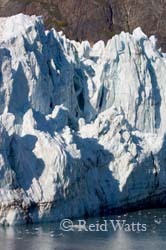 The highlight of many cruisers trip is the day spent viewing and listening to a glacier calving into the bay. On this trip we visited the glaciers of both the Tarr and John Hopkins Inlets, which included Margerie, Grand Pacific, John Hopkins, Lamplugh, and Reid Glaciers. It is our understanding that access to John Hopkins inlet is restricted throughout the better part of the cruising season due to seal migrations, but sailing early or late in the season may allow your ship access to both inlets as it did ours. Glacier Bay is also notable for the many beautiful snowcapped mountains that surround it. As we cruised out of Glacier Bay, we enjoyed sitting in one of the ships outdoor hot tubs enjoying the beautiful mountain views. We've visited glaciers both during peak cruising season and late, and our main advice here is that regardless of when or what glacier you visit, be sure to have along some warm clothing including a hat, gloves, and warm socks. Also be sure to bring along a good pair of sunglasses. Those dressed for the weather are all able to enjoy the sights and sounds for the whole duration of the glacier visit. We saw some whales close to the entrance of Glacier Bay. Also, you might want to watch for seals hanging out on bergie bits. At the entrance to Glacier Bay NP via Icy Straits, lies the town of Hoonah. Some cruise ships visit this quaint town and it is well worth a visit. This is currently a tendered port, but the trip to shore is short. The commercialization of the town thankfully has not yet reached the levels of many of the cruise ship stops. 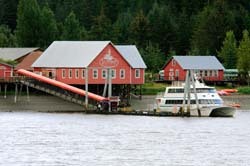 A historic cannery has been tastefully converted into a small shopping mall featuring a small museum, local crafts, restaurants, and, and a Tlingit pharmacy. The main attraction at this port are the zip lines, which are reported to be the longest and fastest around. While we did not zip line, visitors that took the tour reported that it was quite a thrill! The excursion starts with a bus ride up a hill and a historical account of the town. This port is also an excellent place to take a whale spotting excursion. It is very close to Point Adolphus which is known as an excellent whale site, especially for humpbacks. Everyone we spoke with who went whaling reported a great experience and lots of pod activity. 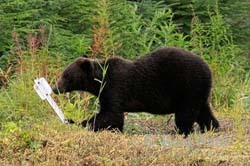 From Hoonah you can also book bear sighting tours. We spent our port time in this activity, and were pleasantly surprised by the area. Bear sighting spots are on native lands and in the Tongass National Forest. When we visited, the rivers had been turned into torrents due to recent heavy rainfalls, so the bears were not frequenting their usual feeding grounds. This made the task of finding bears more difficult, but our able guide found good bear opportunities including a sow with two yearlings. As long as we quietly and respectfully watched from a safe distance, this little family put on a nice show and continued to get closer to us. Unfortunately the show was over when another bear watching tour pulled up from behind and everybody quickly ran out of the van causing the bears to flee. When observing wildlife, it is important that you be as invisible as possible. Abrupt quick moves and noise will cause the animals to vanish. In addition to grizzly bears we sited bald eagles and sitka deer. 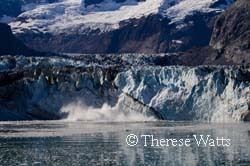 Hope you enjoy our shots from Glacier Bay and its neighbors.